Hello all, this is my first post. I have a lot to say but I’ll try and keep it short and sweet. I arrived in Madrid a few days before my program started, and I recommend this to everyone. I stayed in a hostel with guys from venezuela, australia, and south korea. We explored the city by ourselves, and had a blast. You learn so much more and enjoy things more when a tour guide is not leading you around everywhere with 80 other students. We got lost for a while, but it didn’t matter as we had no schedule to keep. After a few days of doing whatever I pleased, the rest of my group arrived and we had a a lot of fun in Madrid and Toledo before going south to Sevilla where we met our host families for the first time. One thing I was looking forward to most was trying new foods at my homestay. The first night scared me a little, as I was served pasta with sauce that tasted way too much like spagettios. After that though, things got much better. One thing to keep in mind as you travel abroad, TRY EVERYTHING!! The food will be different than at home, even the Ketchup, but look through the menu and order the wildest thing you can find, usually you will not be disappointed. Another recommendation, bring more money than you are told you will need! If other programs are anything like mine, you will spend every night out with others in your program, as no one wants to stay at home doing nothing – we only have so much time here and want to enjoy it as much as possible. You may also meet many other American students in you city with other programs who are also out every night so plan on running into them many places you go. Sevilla is a lot of fun, as is Lagos, Portugal. I spent a weekend on the beaches there, and will never forget it. 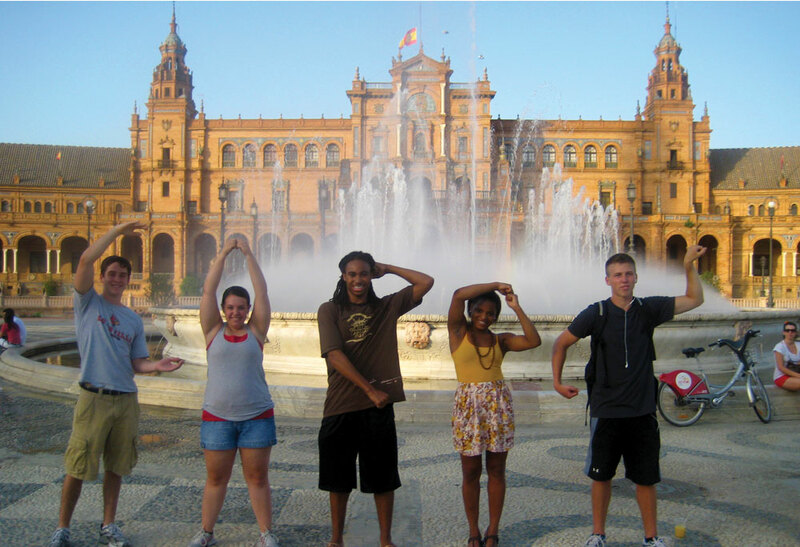 If you study in europe, try as hard as you can to get to Lagos, It is a great place. Do not worry if you know absolutely no portugese, the locals know a lot of english, and dislike it very much if you try to speak spanish to them. One last thing, although the Irish pubs are plentiful in europe, avoid them, there are enough back home. Experience the local places, which are cheaper anyway. If you hate the rain, Sevilla is the place for you, have had nothing but clear skies.